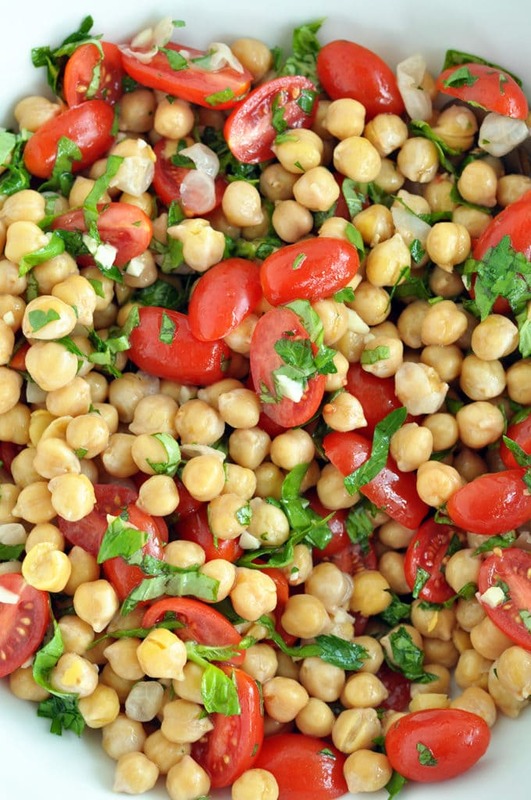 Summer Salad with Chickpeas. I am a huge fan of salads. I like all kinds of salads. Salad recipes are great in the warmer weather since you don’t have to worry about heating up your kitchen. Salad recipes are also usually very budget friendly, not to mention super healthy! 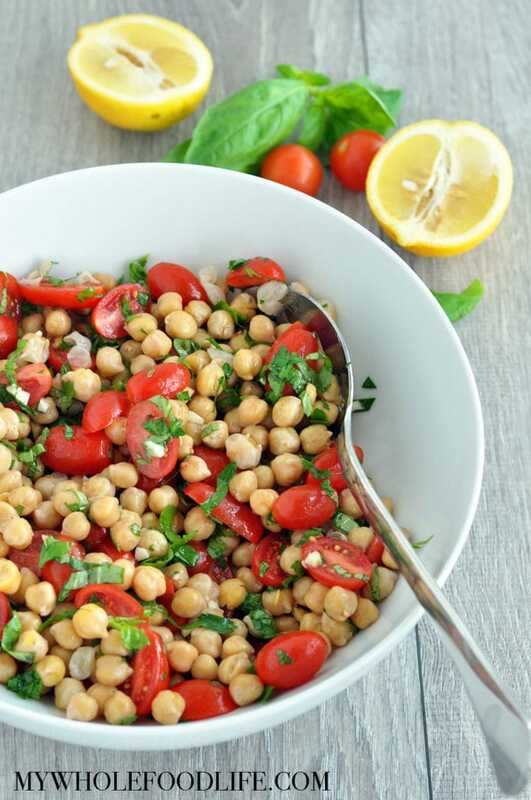 I hope you enjoy this healthy summer salad with chickpeas, basil and tomatoes as much as I did! If you enjoy salads as well, you should check out this post of 12 Quick and Easy Salad Ideas. My basil plant has been growing out of control, so I knew I needed to come up with a few recipes to use it in. Seriously, if you don’t grow your own herbs, you should! It will save you tons of money and they grow well indoors too! An easy and flavorful salad! Place in the fridge for at least 30 minutes so the flavors can marinate. This salad should keep for up to a week in the fridge. Enjoy! Thanks Hannah! I loved it! Yum! I would do this and add some mozzarella for a refreshing summer salad! That would probably be good too! I love salad, but I love chickpeas even more, so this is such a great recipe to me. So perfect for summer! Agreed! I am a sucker for anything with chickpeas. This looks great! I'm definitely pinning so I can make soon! 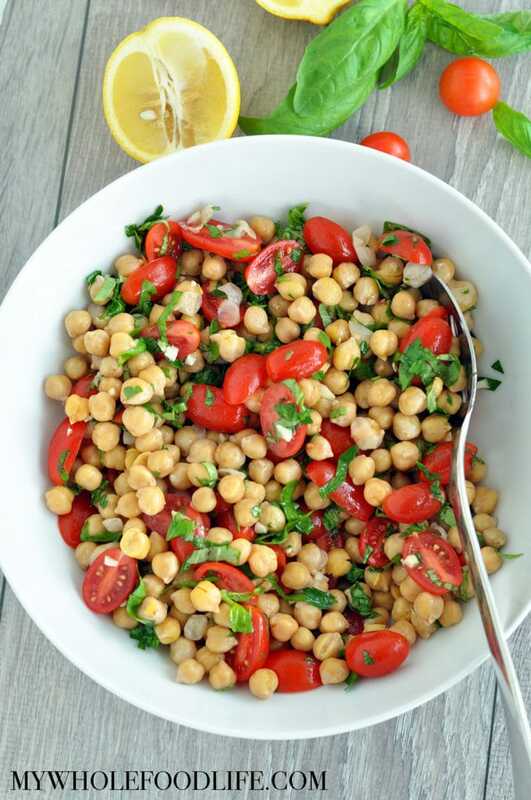 I can't wait to try this as I usually have all those ingredients in our house for a quick side dish but adding chickpea's would be new for us. Thanks for this delish recipe. Pinned! Thank you for pinning! I hope you enjoy the recipe! This may be a stupid question, but how do you harvest basil leaves without killing the plant? Do you just pull leaves off or do you lop off a piece from the top? I had a purple basil plant one year, and I just could not keep it going. I bought two sweet basil plants this year and am hoping I do better with those. . . I just pluck the leaves off mine. It's done great. If you get flowers, you need to pluck them off or the basil will die. Thanks so much Melissa! I had flowers on my purple one so that explains it going kaput. Cross your fingers for me! I loved this recipe. I try to go oil free so I substituted balsamic glaze and it was still yummy. Thanks!